The QTreeWidget class provides a tree view that uses a predefined tree model. The QTreeWidget class is a convenience class that provides a standard tree widget with a classic item-based interface similar to that used by the QListView class in Qt 3. This class is based on Qt's Model/View architecture and uses a default model to hold items, each of which is a QTreeWidgetItem. Developers who do not need the flexibility of the Model/View framework can use this class to create simple hierarchical lists very easily. A more flexible approach involves combining a QTreeView with a standard item model. This allows the storage of data to be separated from its representation. Before items can be added to the tree widget, the number of columns must be set with setColumnCount(). This allows each item to have one or more labels or other decorations. The number of columns in use can be found with the columnCount() function. The tree can have a header that contains a section for each column in the widget. It is easiest to set up the labels for each section by supplying a list of strings with setHeaderLabels(), but a custom header can be constructed with a QTreeWidgetItem and inserted into the tree with the setHeaderItem() function. The items in the tree can be sorted by column according to a predefined sort order. If sorting is enabled, the user can sort the items by clicking on a column header. Sorting can be enabled or disabled by calling setSortingEnabled(). The isSortingEnabled() function indicates whether sorting is enabled. See also QTreeWidgetItem, QTreeWidgetItemIterator, QTreeView, Model/View Programming, and Settings Editor Example. By default, this property has a value of 1. By default, this property has a value of 0. See also columnCount() and currentItem(). Constructs a tree widget with the given parent. Destroys the tree widget and all its items. Appends the item as a top-level item in the widget. Appends the list of items as a top-level items in the widget. Clears the tree widget by removing all of its items and selections. Note: Since each item is removed from the tree widget before being deleted, the return value of QTreeWidgetItem::treeWidget() will be invalid when called from an item's destructor. See also takeTopLevelItem(), topLevelItemCount(), and columnCount(). Closes the persistent editor for the item in the given column. This function has no effect if no persistent editor is open for this combination of item and column. See also openPersistentEditor() and isPersistentEditorOpen(). Closes the item. This causes the tree containing the item's children to be collapsed. See also expandItem(), currentItem(), itemAt(), and topLevelItem(). Returns the current column in the tree widget. See also setCurrentItem() and columnCount(). Returns the current item in the tree widget. See also setCurrentItem() and currentItemChanged(). This signal is emitted when the current item changes. The current item is specified by current, and this replaces the previous current item. Handles the data supplied by a drag and drop operation that ended with the given action in the index in the given parent item. The default implementation returns true if the drop was successfully handled by decoding the mime data and inserting it into the model; otherwise it returns false. Starts editing the item in the given column if it is editable. Expands the item. This causes the tree containing the item's children to be expanded. See also collapseItem(), currentItem(), itemAt(), topLevelItem(), and itemExpanded(). Returns the item used for the tree widget's header. Returns the QModelIndex associated with the given item in the given column. Note: In Qt versions prior to 5.7, this function took a non-const item. See also itemFromIndex() and topLevelItem(). Returns the index of the given top-level item, or -1 if the item cannot be found. See also sortItems() and topLevelItemCount(). Inserts the item at index in the top level in the view. If the item has already been inserted somewhere else it won't be inserted. See also addTopLevelItem() and columnCount(). Inserts the list of items at index in the top level in the view. Items that have already been inserted somewhere else won't be inserted. Returns the tree widget's invisible root item. The invisible root item provides access to the tree widget's top-level items through the QTreeWidgetItem API, making it possible to write functions that can treat top-level items and their children in a uniform way; for example, recursive functions. Returns true if the given item is set to show only one section over all columns; otherwise returns false. Returns whether a persistent editor is open for item item in column column. See also openPersistentEditor() and closePersistentEditor(). Returns the item above the given item. This signal is emitted when the user activates an item by single- or double-clicking (depending on the platform, i.e. 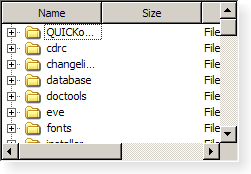 on the QStyle::SH_ItemView_ActivateItemOnSingleClick style hint) or pressing a special key (e.g., Enter). The specified item is the item that was clicked, or 0 if no item was clicked. The column is the item's column that was clicked, or -1 if no item was clicked. Returns a pointer to the item at the coordinates p. The coordinates are relative to the tree widget's viewport(). Returns a pointer to the item at the coordinates (x, y). The coordinates are relative to the tree widget's viewport(). Returns the item visually below the given item. This signal is emitted when the contents of the column in the specified item changes. This signal is emitted when the user clicks inside the widget. The specified item is the item that was clicked. The column is the item's column that was clicked. If no item was clicked, no signal will be emitted. This signal is emitted when the specified item is collapsed so that none of its children are displayed. Note: This signal will not be emitted if an item changes its state when collapseAll() is invoked. See also QTreeWidgetItem::isExpanded(), itemExpanded(), and collapseItem(). This signal is emitted when the user double clicks inside the widget. The specified item is the item that was clicked, or 0 if no item was clicked. The column is the item's column that was clicked. If no item was double clicked, no signal will be emitted. This signal is emitted when the mouse cursor enters an item over the specified column. QTreeWidget mouse tracking needs to be enabled for this feature to work. This signal is emitted when the specified item is expanded so that all of its children are displayed. Note: This signal will not be emitted if an item changes its state when expandAll() is invoked. See also setItemExpanded(), QTreeWidgetItem::isExpanded(), itemCollapsed(), and expandItem(). Returns a pointer to the QTreeWidgetItem associated with the given index. This signal is emitted when the user presses a mouse button inside the widget. This signal is emitted when the selection changes in the tree widget. The current selection can be found with selectedItems(). Returns the widget displayed in the cell specified by item and the given column. Returns a list of MIME types that can be used to describe a list of treewidget items. Opens a persistent editor for the item in the given column. See also closePersistentEditor() and isPersistentEditorOpen(). Removes the widget set in the given item in the given column. Ensures that the item is visible, scrolling the view if necessary using the specified hint. See also currentItem(), itemAt(), and topLevelItem(). Returns a list of all selected non-hidden items. Sets the current item in the tree widget. Unless the selection mode is NoSelection, the item is also selected. See also currentItem() and currentItemChanged(). Sets the current item in the tree widget and the current column to column. Sets the current item in the tree widget and the current column to column, using the given command. Sets the given item to only show one section for all columns if span is true; otherwise the item will show one section per column. Sets the header item for the tree widget. The label for each column in the header is supplied by the corresponding label in the item. The tree widget takes ownership of the item. See also headerItem() and setHeaderLabels(). Adds a column in the header for each item in the labels list, and sets the label for each column. Note that setHeaderLabels() won't remove existing columns. See also setHeaderItem() and setHeaderLabel(). Sets the given widget to be displayed in the cell specified by the given item and column. The given widget's autoFillBackground property must be set to true, otherwise the widget's background will be transparent, showing both the model data and the tree widget item. This function should only be used to display static content in the place of a tree widget item. If you want to display custom dynamic content or implement a custom editor widget, use QTreeView and subclass QItemDelegate instead. This function cannot be called before the item hierarchy has been set up, i.e., the QTreeWidgetItem that will hold widget must have been added to the view before widget is set. Note: The tree takes ownership of the widget. Returns the column used to sort the contents of the widget. Sorts the items in the widget in the specified order by the values in the given column. See also insertTopLevelItem(), topLevelItem(), and topLevelItemCount(). Returns the top level item at the given index, or 0 if the item does not exist. See also topLevelItemCount() and insertTopLevelItem().